The plan was good but I bit off more than I could chew. 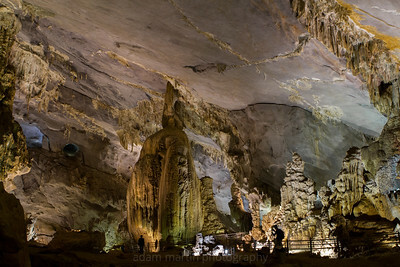 I envisioned myself having all the time in the world to photograph the amazing caves in Central Vietnam. 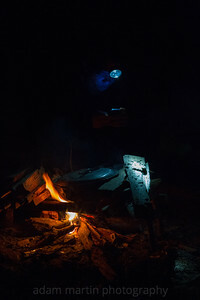 But what I hadn't realized was that I had signed on for an expedition style caving experience including hiking up and over mountains, down eroded limestone trails through the jungle, river crossings, roping in to blackness with the sound of a fast flowing river beneath, throwing myself into pitch black rivers, swooped by bats, sleeping in a hammock, sleeping in a cave, getting cold, getting hot, getting nervous and loving every moment of it! 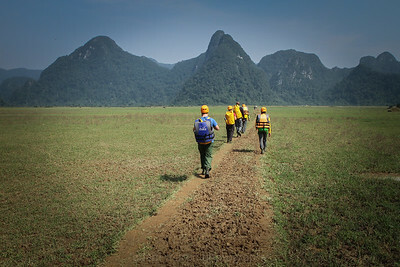 I booked my Tu Lan Adventure trip with Oxalis Caving in Phong Nha and i also tacked on one more day. I had a truly amazing adventure. 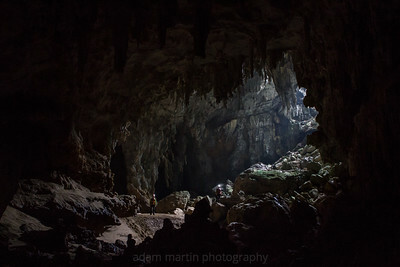 However this kind of caving doesn't lend itself to photography. 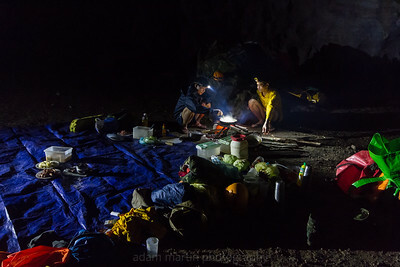 Stowing my gear in three dry bags made most photos an effort just to get the camera out. 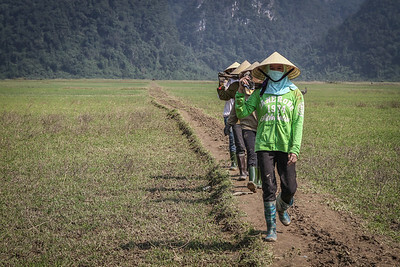 After the three days caving we made it back to Tan Hoa village where we started trekking from and I spent some time wandering around there before we drove back 70kms to the town of Phong Nha. 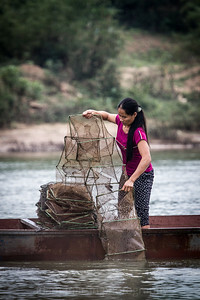 I watched as she pulled in the whole net and there wasn't any catch whatsoever. 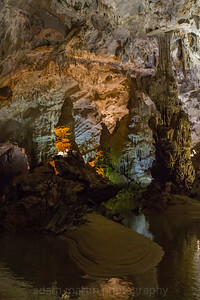 The most accessible cave in the area and the easiest. 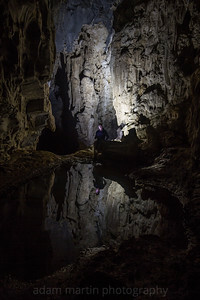 A boat journey takes you in to this subterranean wonderland. 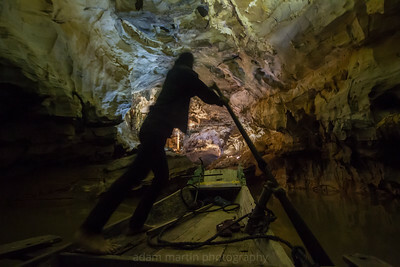 Totally surreal paddling through these caves. 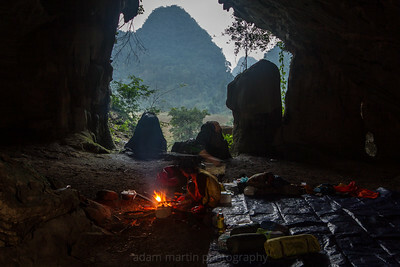 Some people hate caves with lighting, they think it looks too contrived and tacky but have they tried being in one that isn't lit? That's another kettle of fish entirely. 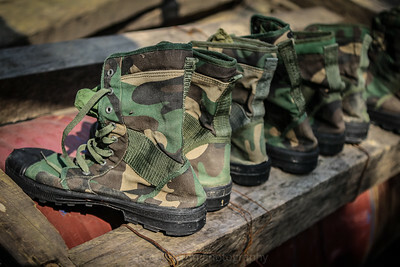 Cambodian army jungle boots were the shoes of choice for this caving adventure. Great grip, lightweight, comfortable and pretty quick drying too! Walking is a way of life. From the village to the areas that were being farmed was at least 2 kilometers away. 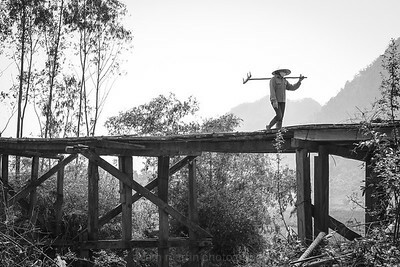 The first part of the journey was a trek in to the hills through recently plowed fields. We turned right in the distance and then the first obstacle was a river crossing swim. Our porters Trung & Nam wade across the first river on their way to set up camp for night 1. This is terrible, I am not sure what cave this one is. I think it is the exit to Hang Ton cave but I will get that confirmed. 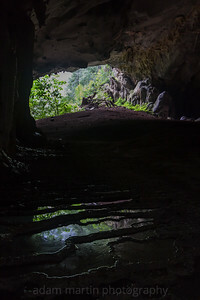 Oxalis Caving guide - Thanh. An excellent guide, a wonderful chap and good company too. I don't think he was looking for recipes. 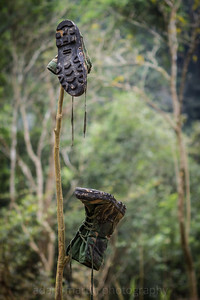 Drying my boots after a hard day's slog. 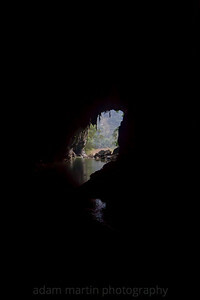 We swam to the entrance before scrambling through Tu Lan Cave over some very tricky sections in virtual darkness. We same in absolute blackness, the kind of dark where you feel you've become blind. 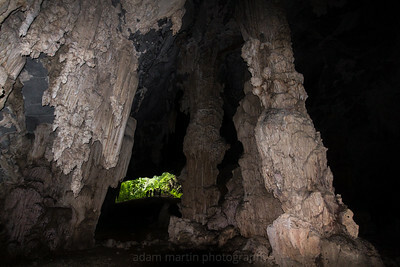 tu Lan cave was discovered in 2010. 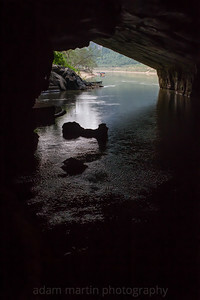 Reflections at the exit to Tu Lan Cave. 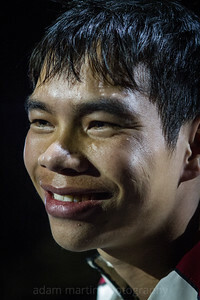 Tu Lan was only discovered in 2010. 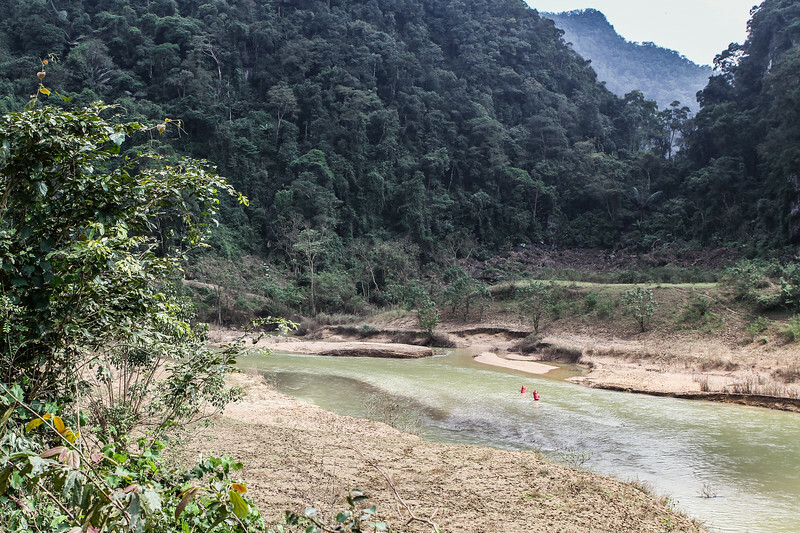 From the entrance to Hang Ton looking back over the valley in the direction of Tan Hoa Village. 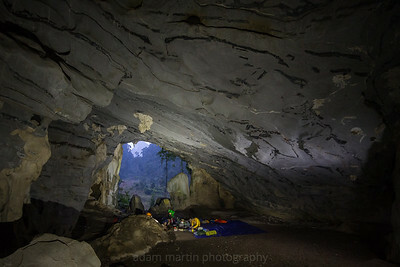 Hang Ton Cave before sunset. 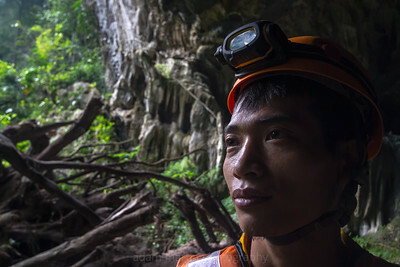 Trung, the hardy porter was not happy when we arrived at the camp in the mouth of Hang Ton Cave. 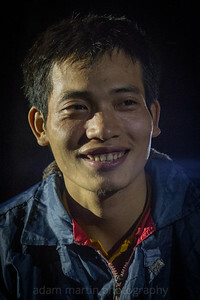 Another guy was meant to bring the supplies to the cave whilst Trung was with us but he got drunk instead so, Trung had to do an extra 12 kms return to Tan Hoa Village.